It’s winter in Dubai, and no one wants to spend all their time indoors. The weather is at its best and we are all want to make the most of it while it lasts. That’s why, I’ve been trying out different outlets for a weekend breakfast. But they must have one thing in common: a terrace or outdoors seating area. 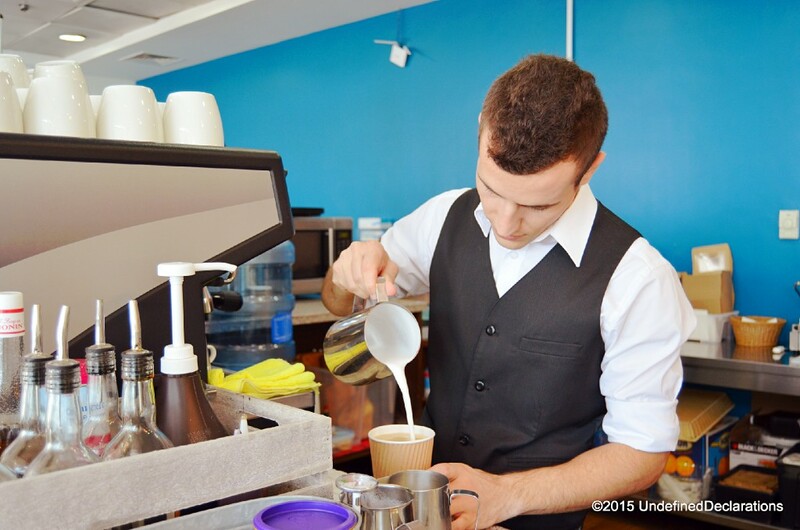 Luckily, Urban Bistro has recently expanded their terrace to accommodate more people. I’ve visited this cool Media City cafe a few months ago and tried their Friday brunch – which I think you should too. 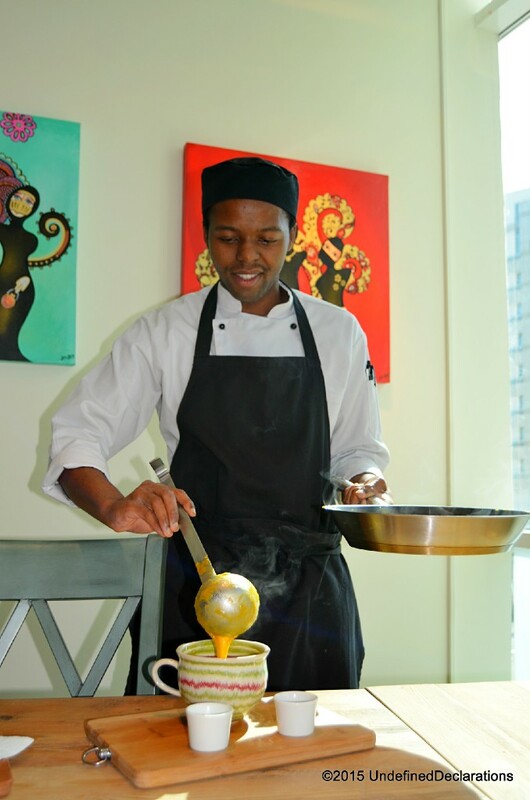 The brunch had a great selection of fresh salads, healthy and tasty juice blends, and a good variety of main courses. Today, I opted for the breakfast meal. My friend and I both went for the vegetarian breakfast. You can choose how you want your eggs to be cooked – we had ours poached. This healthy breakfast option comes with sauteed spinach, roasted cherry tomatoes, avocado slices, Portobello mushrooms, and roasted new potatoes. 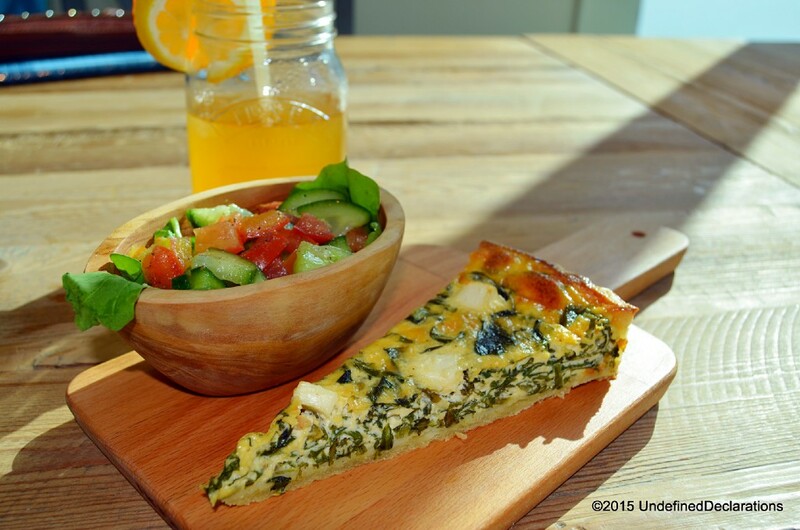 If you’re someone who doesn’t like to have any meat (chicken, beef or salmon) with their breakfast, then you should give Urban Bistro’s vegetarian breakfast a try. 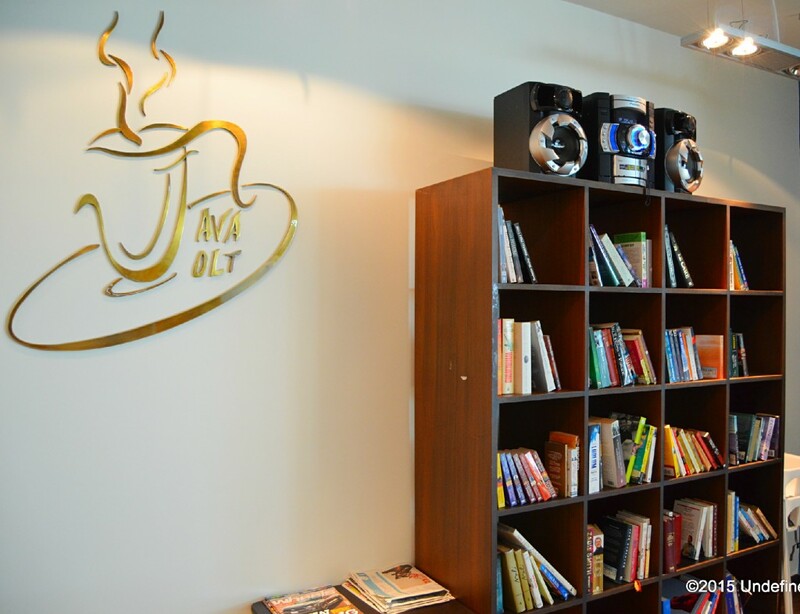 And if you’re tired of the conventional glass of orange juice with your breakfast, then you’ll love the different blends that they serve at this chilled Media City cafe. I personally prefer to go somewhere quiet and peaceful on the weekend – away from the busy cafes and malls. Somewhere where I can have a nice conversation with a friend, work peacefully on my laptop, or just take in the beautiful view as I sip on my cup of latte. Urban Bistro is a hidden gem that I’m glad I discovered. 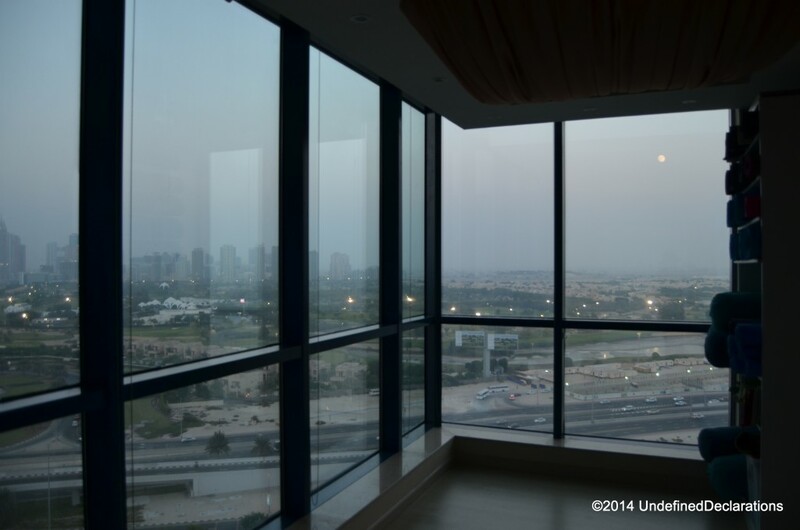 It’s located in a lovely area of Dubai Media City – surrounded by a tranquil and peaceful green space. There’s even a lake with turtles and sea birds in front of the cafe – perfect for a day of relaxation. 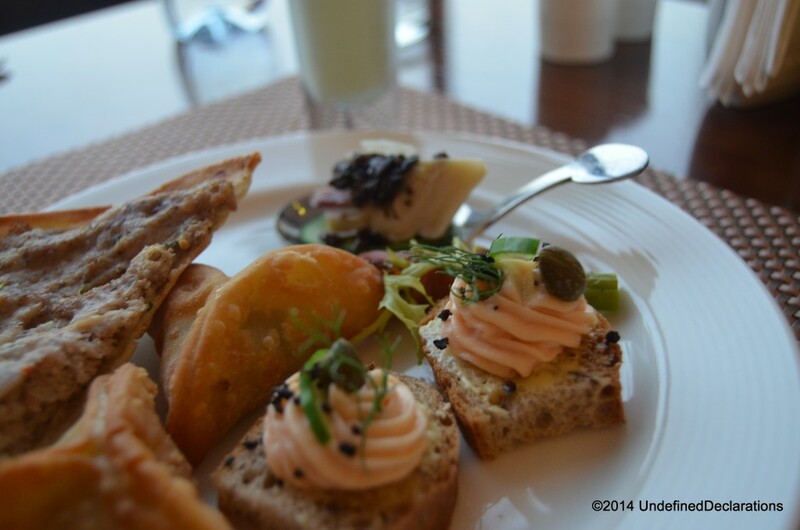 Whether you work in Dubai Media City or just live nearby, then I would definitely recommend that you check out Urban Bistro. On weekdays, the place is buzzing with media professional and other working people on their lunch break. And in the weekends, it is the epitome of tranquility and peacefulness in a busy, modern city life. 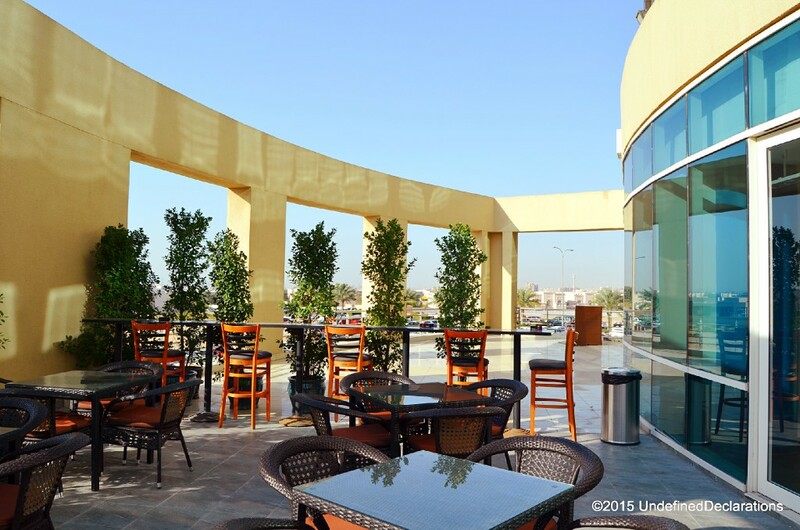 Web site: Urban Bistro Dubai. 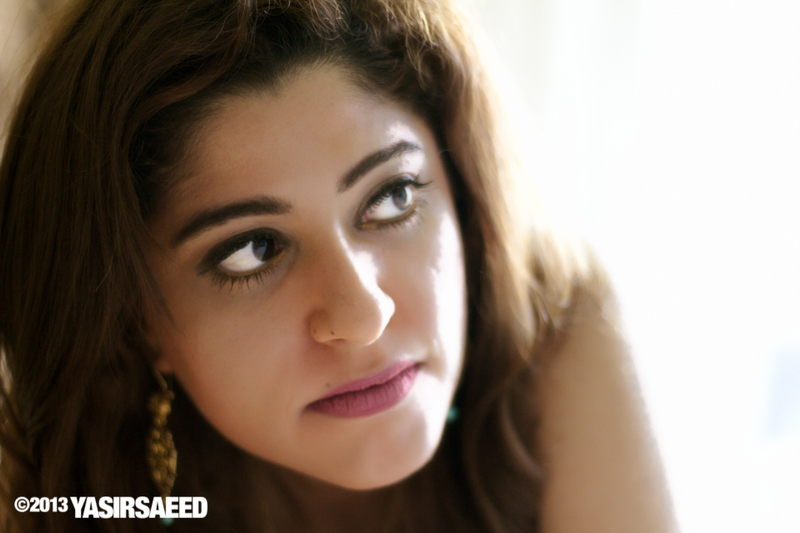 My Photo Essay on Sole DXB event that took place on the 14th and 15th of November. I was there on the 14th of November for a few hours, taking photos and meeting up with some friends. Many think that Dubai’s street culture doesn’t exist. 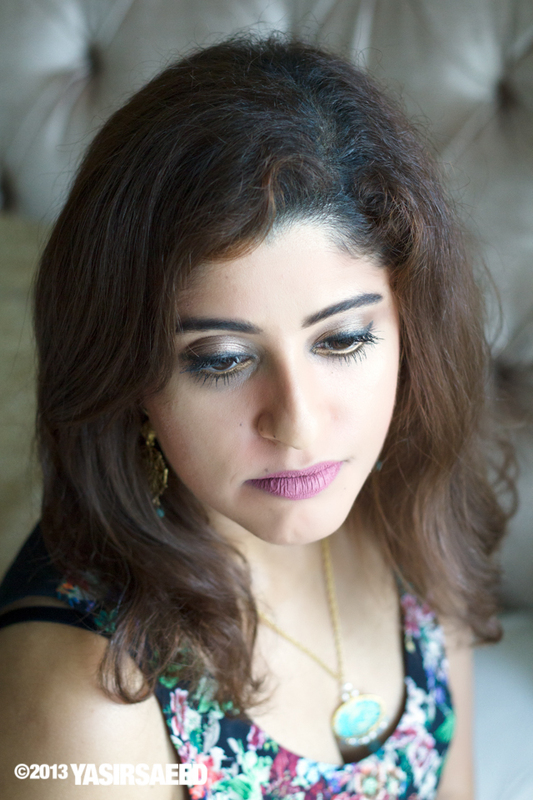 The organisers of Dubai’s urban lifestyle and culture event want to change that misconception. 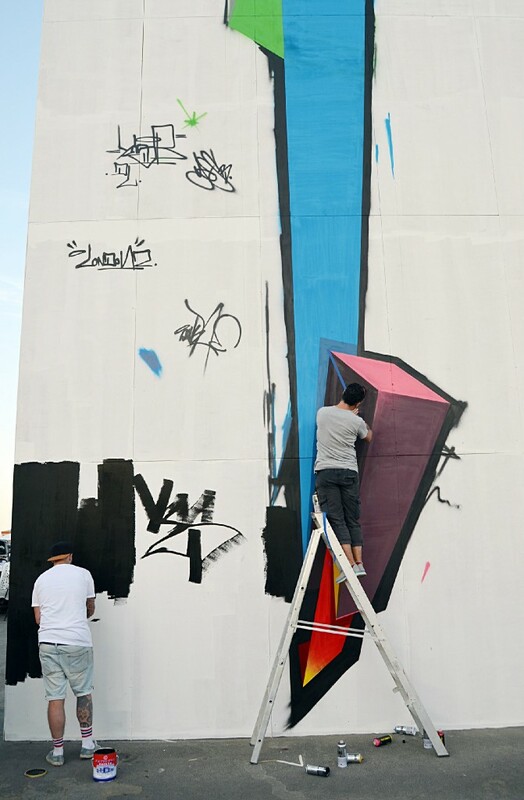 The city’s first – one of its kind event, Sole DXB was staged at Dubai Design District to showcase the region’s latest street culture trends. Specifically the footwear, fashion, basketball, hip hop, and street art. 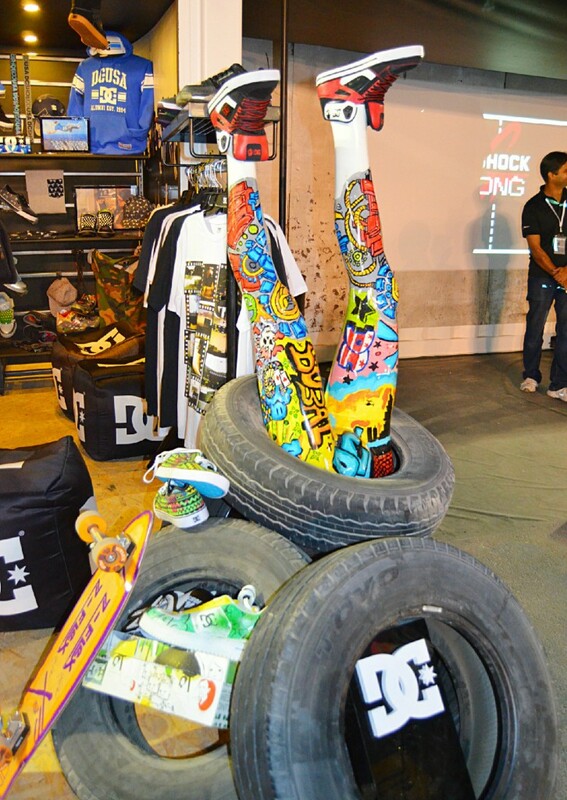 Those who made their way to the venue were treated by regional retail brands; Nike, Puma, and Reebok. DJ’s, live performances and panel discussions pumped life into the event and gave it a fresh and exciting community atmosphere. With a hidden construction site chosen as a venue for this year’s Sole DXB event, indeed it is underground. 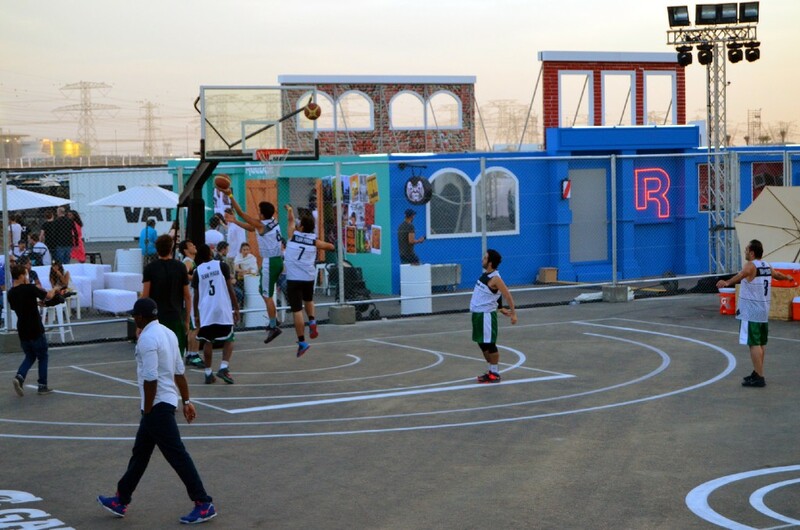 Professional basketball players take turns at shooting hoops at Sole DXB’s grounds in celebration of basketball culture. Dubbed ‘Ball Above All’, the competition saw the victor walk away with 10,000 AED. The game has proved to be a popular way to bring the community together. The only stipulation was that entrants must be 18 or older to apply to play in the tournament. British artist, Remi Rough and his counterpart YesBee are busy creating the freestyled ‘Mondrian vs Wildstyle’ art piece. 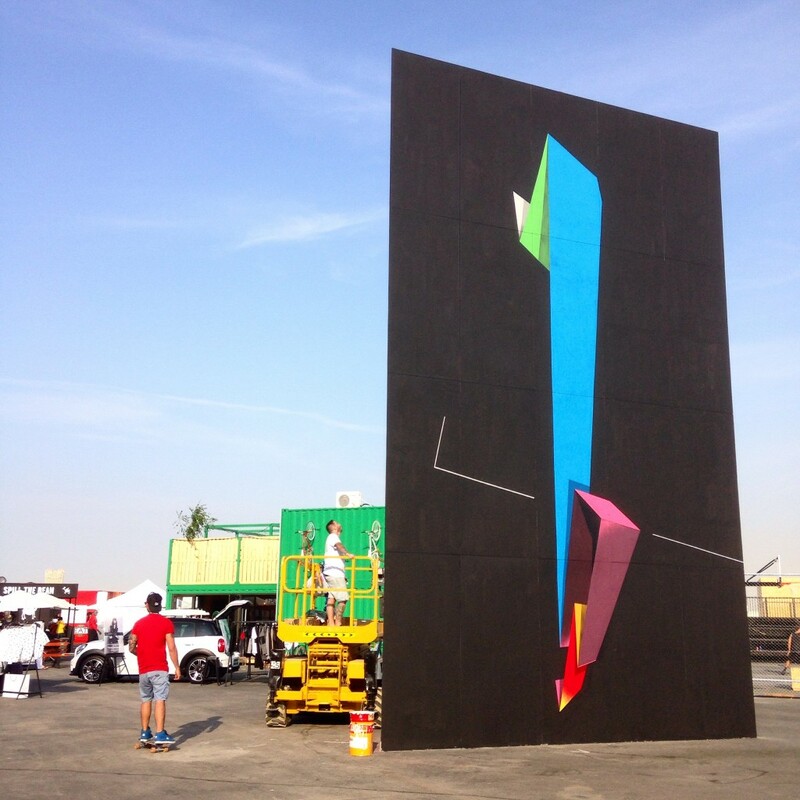 A 3 x 10 meter art work; spray painted using ‘Montana 94’ paint. Remi’s art began on walls and trains in South London in 1984. By his own admission, “I didn’t invent straight lines, I just made them funky!” – said Rough of his work. Canadian pop artist, Antoine Tavaglione – also known as Tava is a muralist and illustrator based in Montreal. 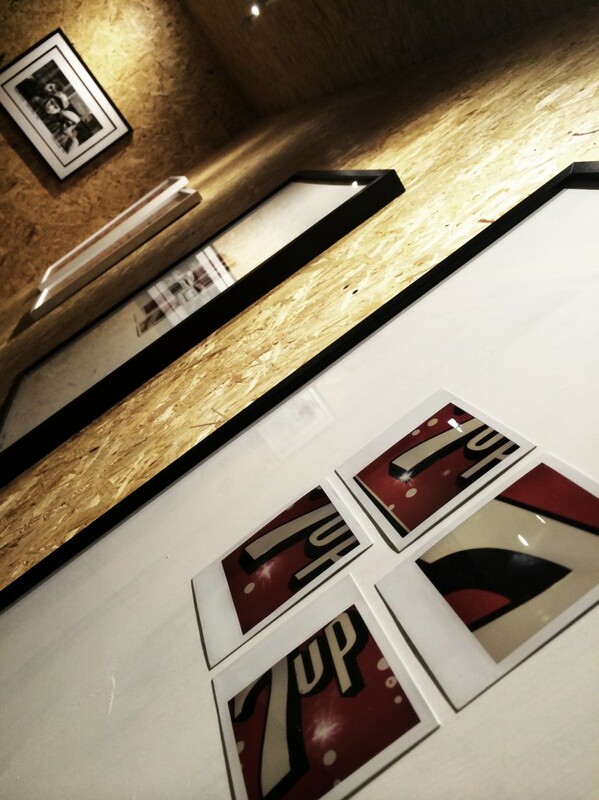 Famed for his signature ‘dripping milk’ paintings, his “Che Cazz” piece proved a popular addition to Sole DXB. 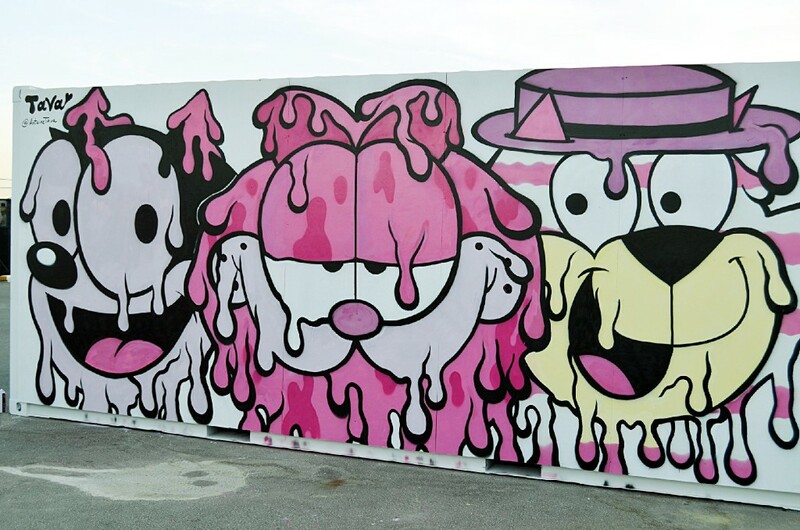 The cat figure mural was created in one day, and produced using spray cans. 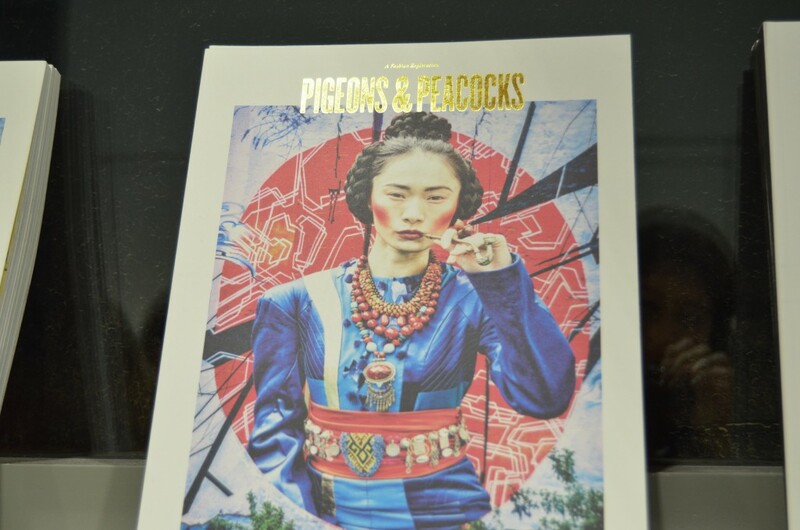 ‘The Irezumi Girls’ are part of a limited edition created by Dubai-based design studio Robot and Spark. 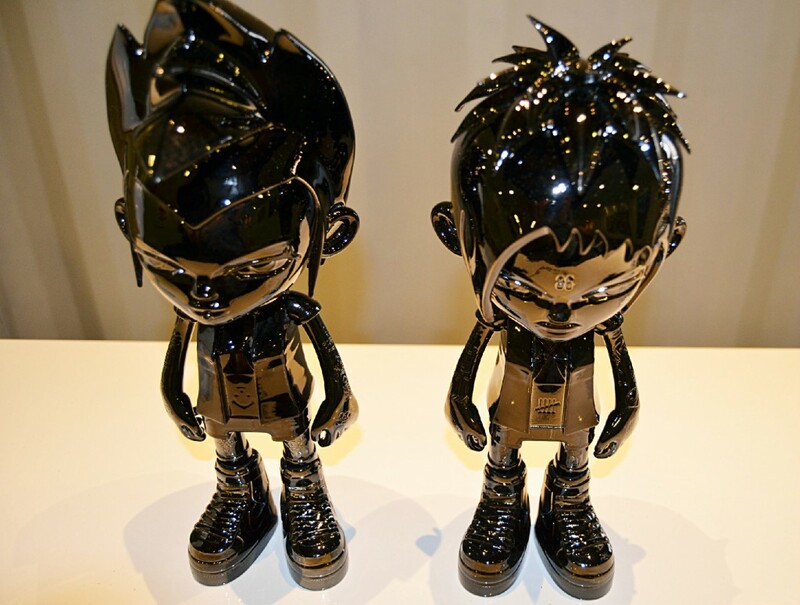 The figures are made using cast resin material with a chrome finish. The artist imagined these toys to live in the year 2075 in the city of London. ‘The Irezumi Girls’ are a gang of heavily tattooed, uber cool, superhero vixens hailing from Baker Street Station. 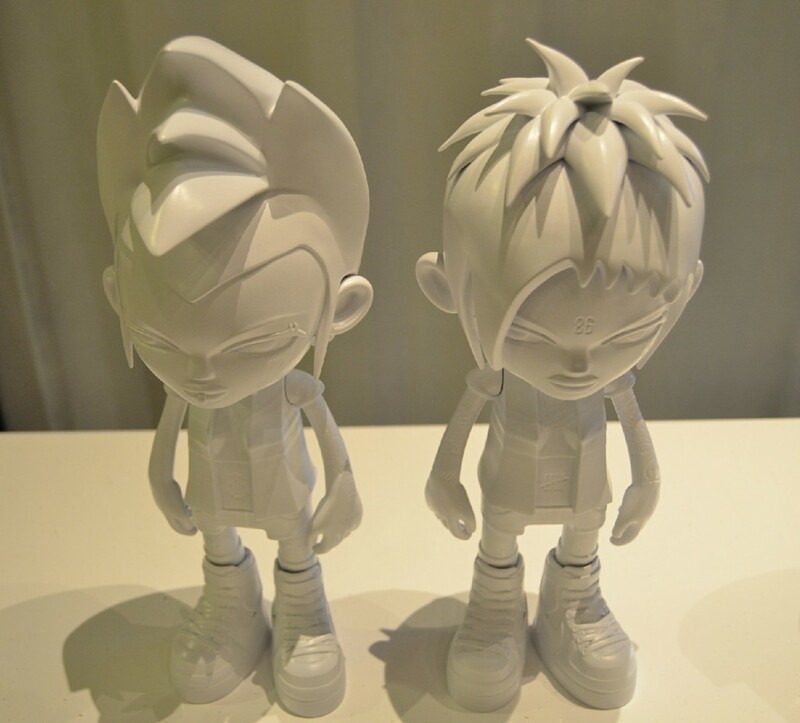 Creative Director Robert Gibbs from design studio Robot and Spark has been working on these original figurines since 2009. The germ of the idea came from a fiction-story about a group of futuristic, rebellious and superhero vixens – namely Lipstick and Suicide. The futuristic fantasy eventually came to life at Sole DXB’s gallery, after a five-year obsession. British artist and photographer, Julian Castaldi expresses his love for Italian company ‘Campag’ with this painting of a vintage bicycle. His cobalt blue piece was inspired by his love for cycling, and the iconic company. 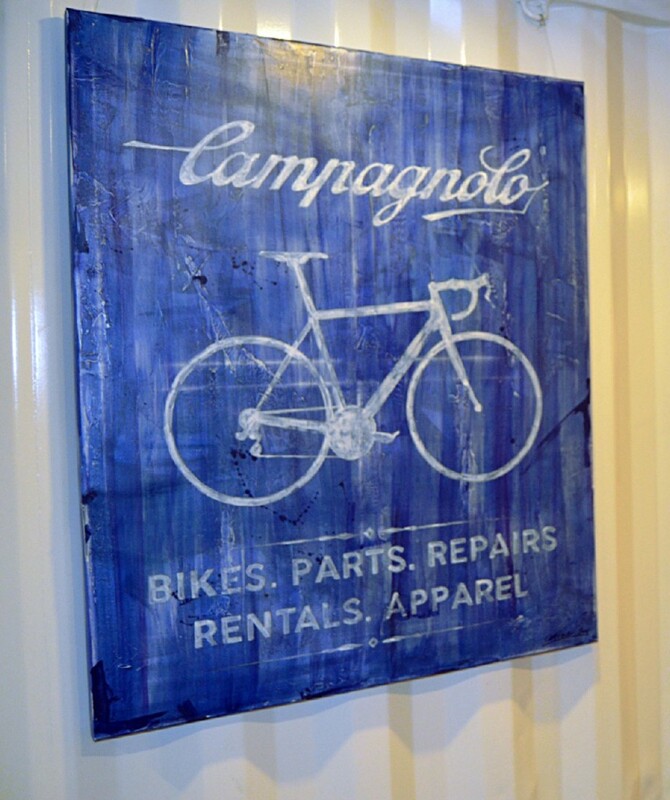 Julian explains the concept by saying: “I have always loved the logo and story behind the brand.” The ‘Campagnolo’ painting uses acrylic, enamel, pastels, and lacquer on a 4 feet x 3 feet canvas. Corcel, a Dubai-based bicycle and apparel store take cycling lovers back to the good old days with their 50’s/60’s inspired collection. 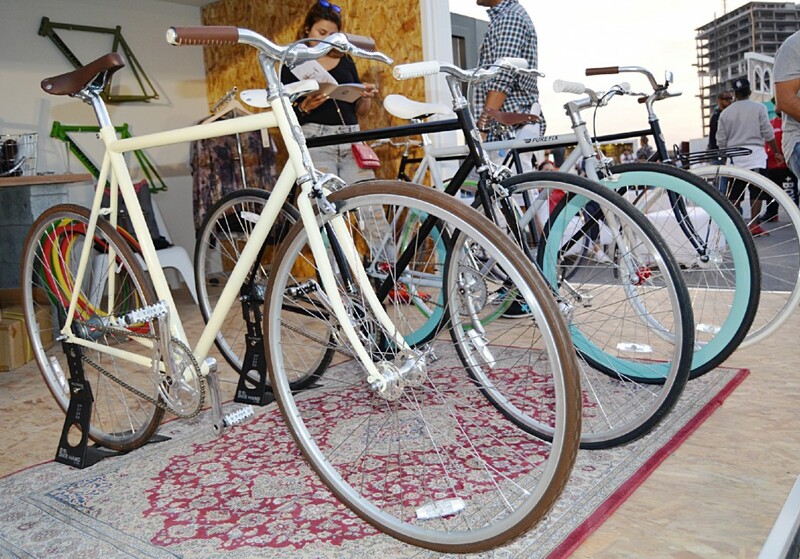 The ‘Bikeid’ range was created for a nostalgic bicycle experience. 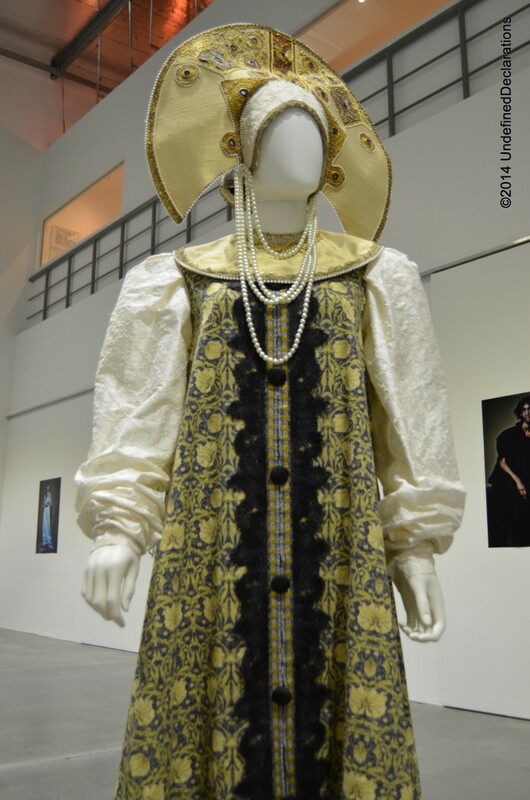 The simple, elegant, and vintage designs can be customized for personal taste. A couple interested in getting a bike are looking at the catalogue and selecting their preferred colour of bike and tires. 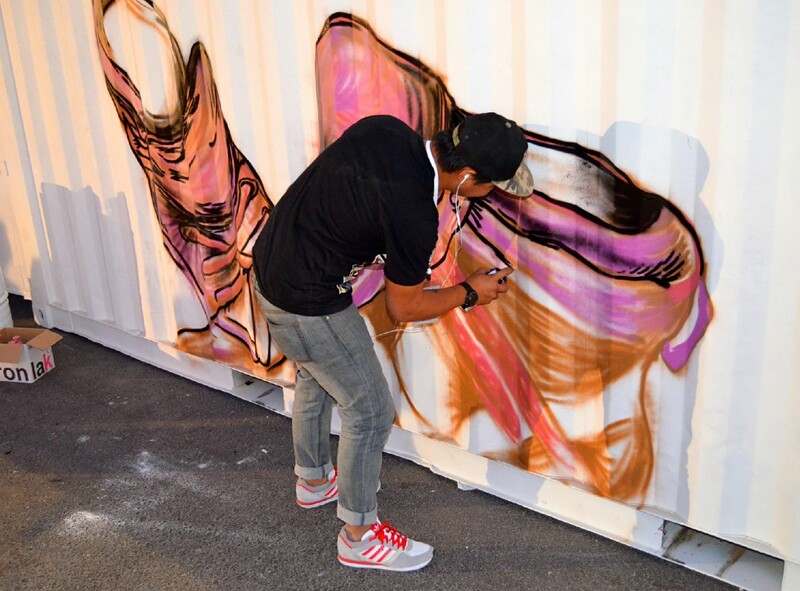 An amateur artist is keeping himself busy by drawing a pair of sneakers using spray paint. Despite his aching fingers from the excessive amount of pressure while completing this piece of art, he is determined to leave his mark at Sole DXB. He asks the audience: “Does it look like a shoe?” and feels ecstatic after their approval. The stylish crowd attending the urban lifestyle event did not overlook making a fashion statement with their favourite pair of sneakers. 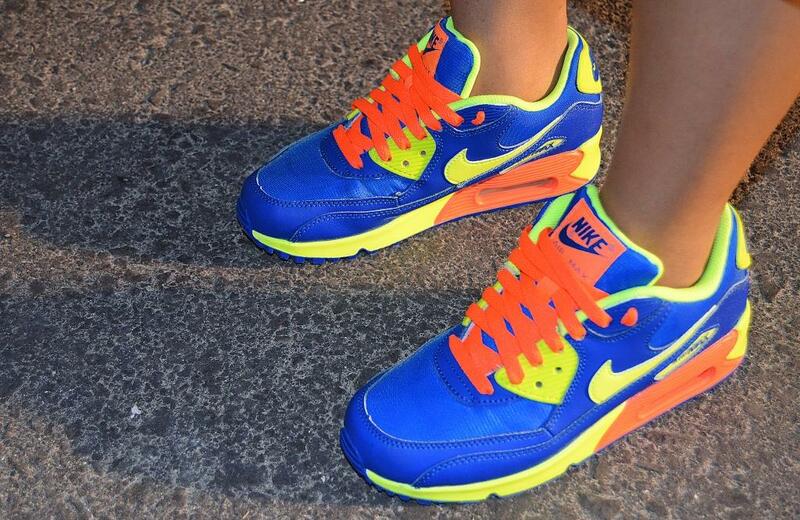 A young lady sporting a very bright and colourful pair of ‘Nike’ trainers caught my attention. She told me that they were a recent buy from the brand’s latest collection. 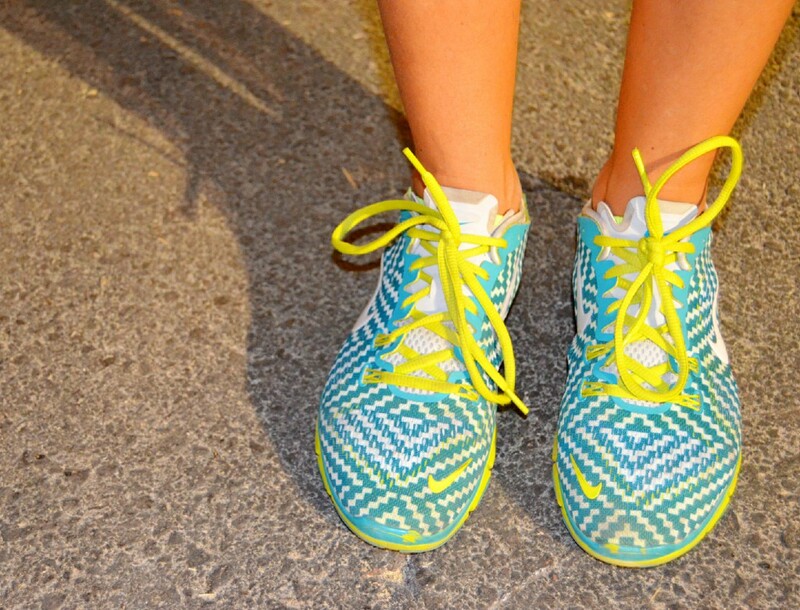 Another original pair of ‘Nike’ trainers worn by one of the ladies attending the street art event. When I asked her about the unique running shoes, she told me the story behind them and how they’ve been worn out at a music festival overseas. “I bought them from Barcelona – for a rave.” she said. I thought they still looked new and exotic! A priceless moment in time, as I am transformed back to the 90’s at street wear label Amongst Few’s interactive gaming space. The highlight of the event for me was discovering this cool 90’s inspired concept brand. Founded in 2013, Amongst Few is a Dubai-based street wear brand that merges traditional Emirati outfit inspiration with Western style. 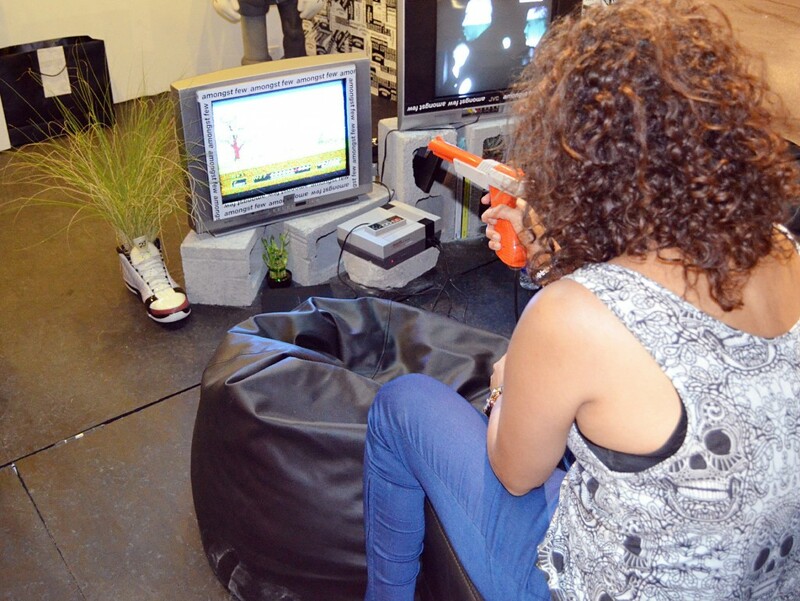 In my nostalgic 90’s flashback, I can be seen playing the game ‘Duck Hunt’ on a 1983 Nintendo Entertainment System (NES) console – complete with classic TV sets and 90’s memorabilia. A great variety of second-hand sneakers on display at the sneaker swap stall. Trendy and pristine trainers to match every age and style fill the wooden racks at this sneaker wonderland. Get lost in time as you look for the perfect pair to replace your worn out and tired sneakers. No cash? 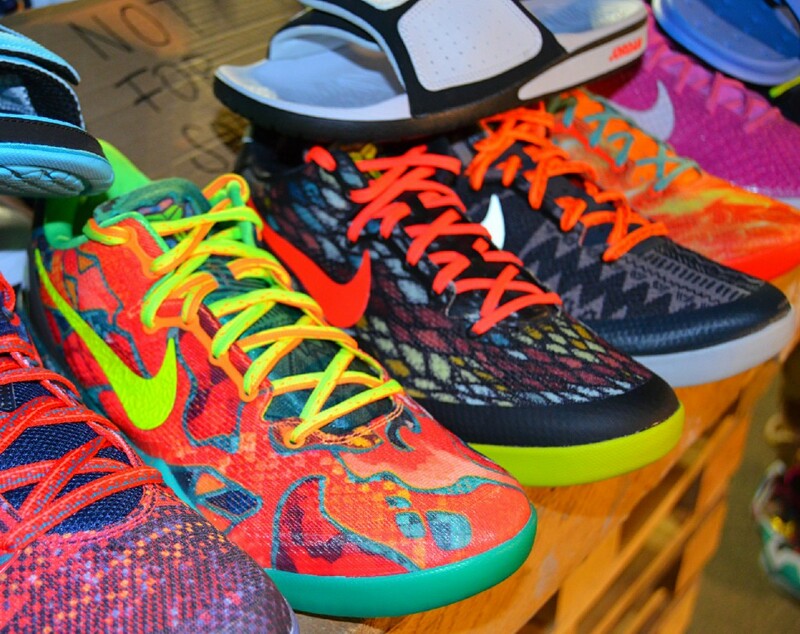 Don’t worry, you can trade in the currency of sneakers! 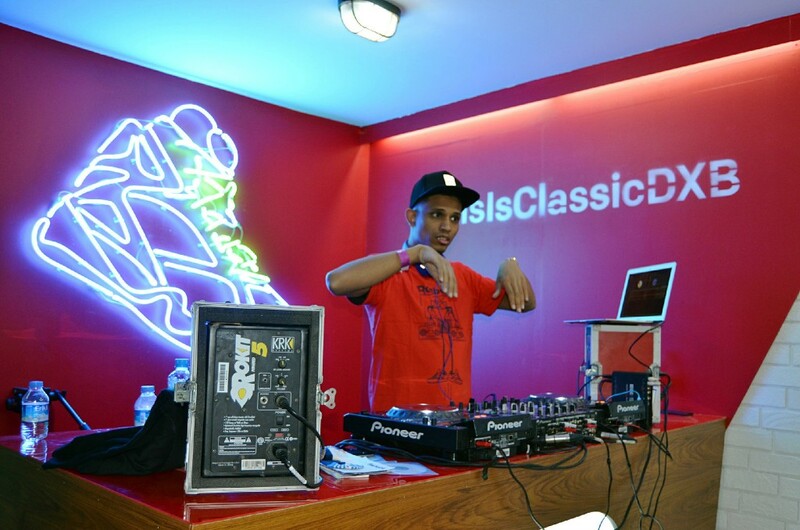 Dubai-based urban and R&B DJ, Mr. Shef Codes livens up the Reebok space with his top old-school R&B beats. Shefan Lantra, better known as Mr. Shef Codes is currently signed with Bliss Inc Entertainment and plays at local venues around the city. The tunes he was playing were so addictive, they kept the crowd glued to the Reebok stand far longer than they intended to be there. 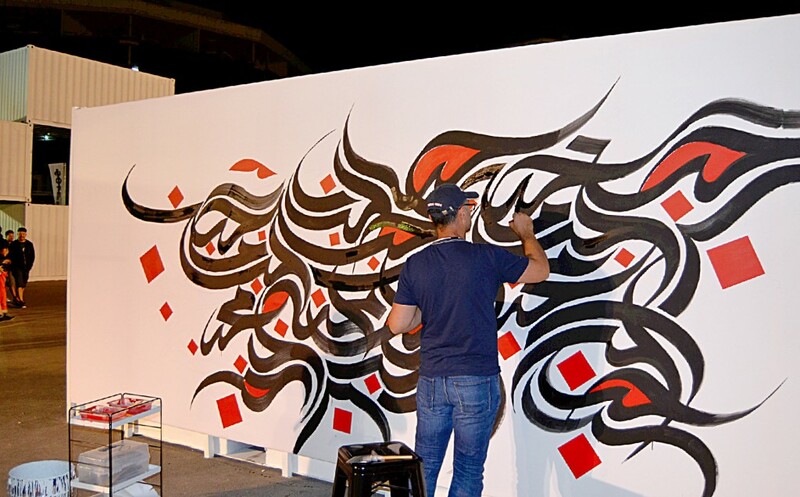 Iraqi artist, designer, calligrapher, and typographer Wissam Shawkat creates a ‘calligraffiti’ piece of art in his signature modern Arabic calligraphy style. 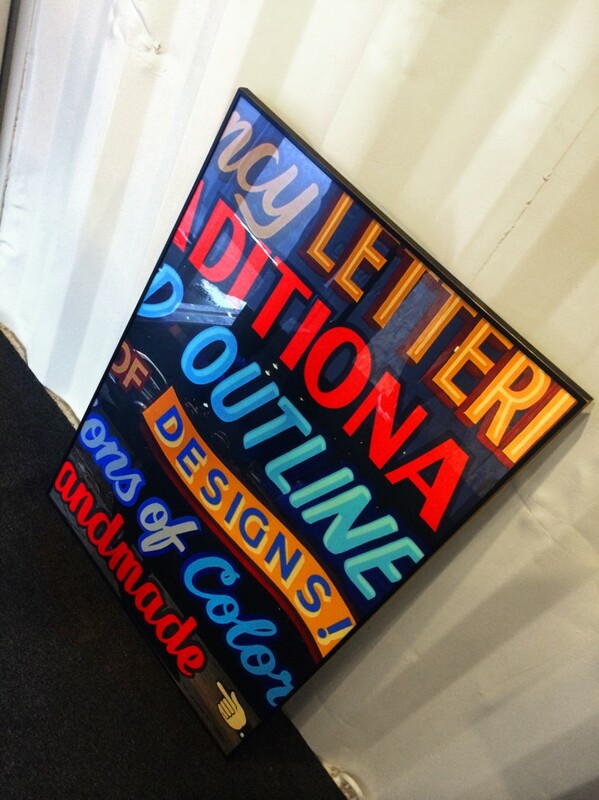 The art work includes the words (love, affection) written in calligraphy style. The Dubai-based artist has been in love with the classical writing style since he was 10 years old. He is using acrylic colours on canvas to create the aptly titled ‘Love for the Sole (Soul)’ piece. I won these lovely designer PUMA sneakers in a competition that I entered with Stylist Arabia magazine. All I had to do was share a photo of my favourite pair of sneakers! This pair was part of a collection for autumn/winter 2014, in a collaboration between PUMA and East Coast creative Sophia Chang. The designer’s illustrations are inspired by New York, and specifically the Brooklyn area. Materials used: acrylic, enamel, lacquer on canvas : 4feet diameter. 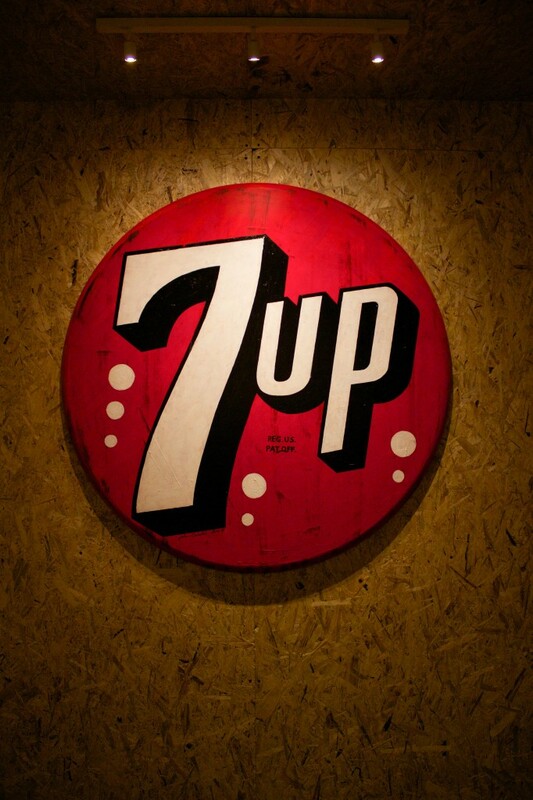 Concept: Just love the old school soda labels I actually collect vintage skateboards, soda bottles amongst other things. 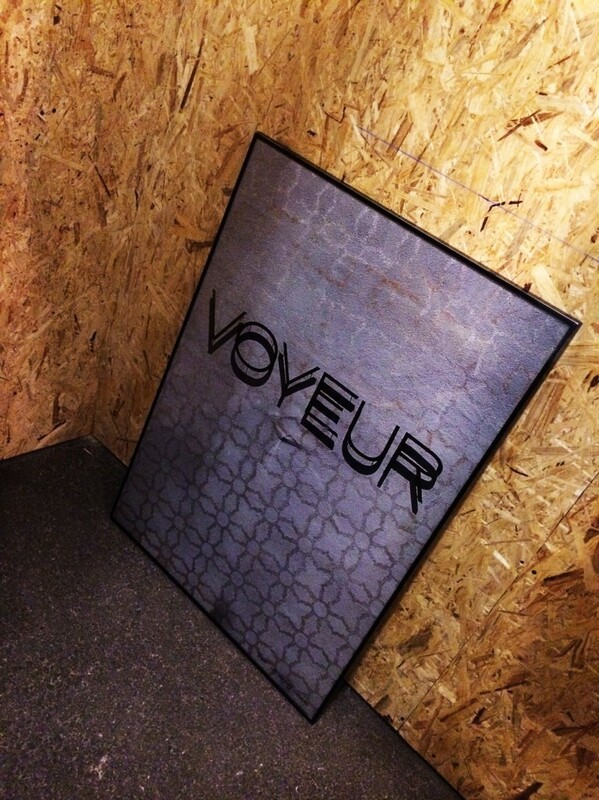 Materials used: 100cm x 70cm in metal frame. Concept: Shot in London and used in Urban Outfitters. Concept: Love the signage and billboards around LA lots of hand painted and distressed signage which looks amazing, this was shot around Melrose in LA. Concept: Used to drive past this private members club on Santa Monica Blvd, it had a mysterious look and I stopped one morning to shoot the pic. Framed original Polaroids shot in LA 2005 on painted board. 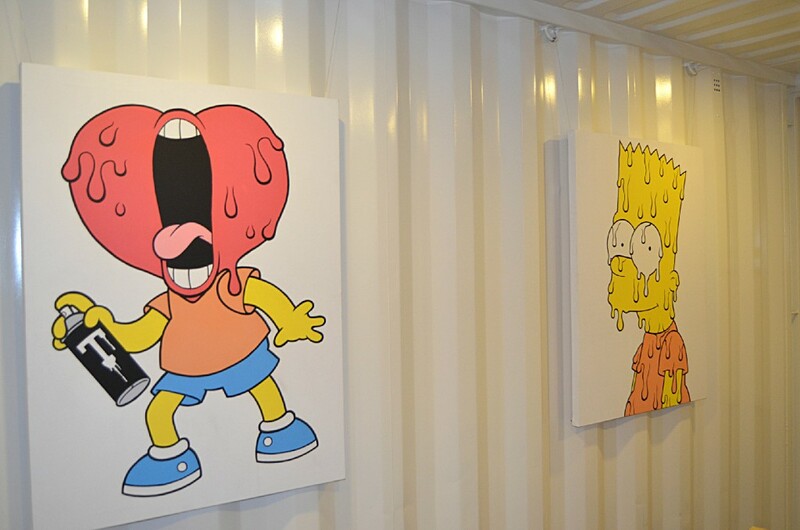 For more information about Sole DXB or any of the artists mentioned in this post, check the links included in this post. 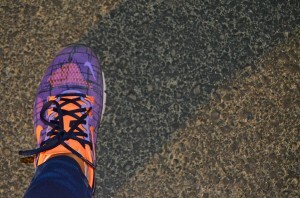 My personal pair of sneakers which I wore to Sole DXB! Here’s a news story that I did for one of my University projects. The course is called “Web News Production” and it really helped me in a lot of ways. I learned how to write news stories for the web, add photos to a slideshow (coming soon in my next project) and create a short video to add value to the story. 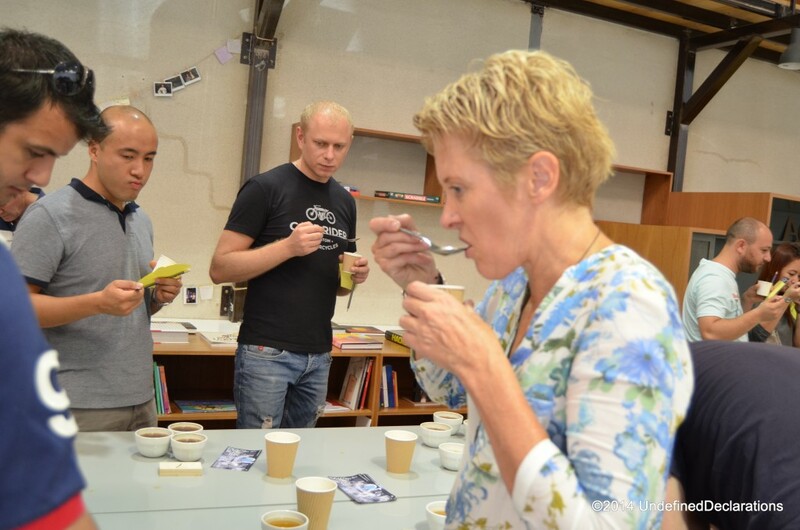 In a genuine desire to share knowledge about coffee and its roasting process, Sabado Coffee Club – a group founded by Matthew Wade who co-runs fat Nancy’s new diet with Anabelle de Gersigny – hosts a monthly coffee tasting event for coffee lovers around the city. The venue for the club’s meeting – which takes place on the first Saturday of each month – is subject to change. Anyone who is interested in attending their events can follow the club’s coffee, art and culture dedicated blog (http://fatnancysnewdiet.com/) for details about the next event’s date and location. 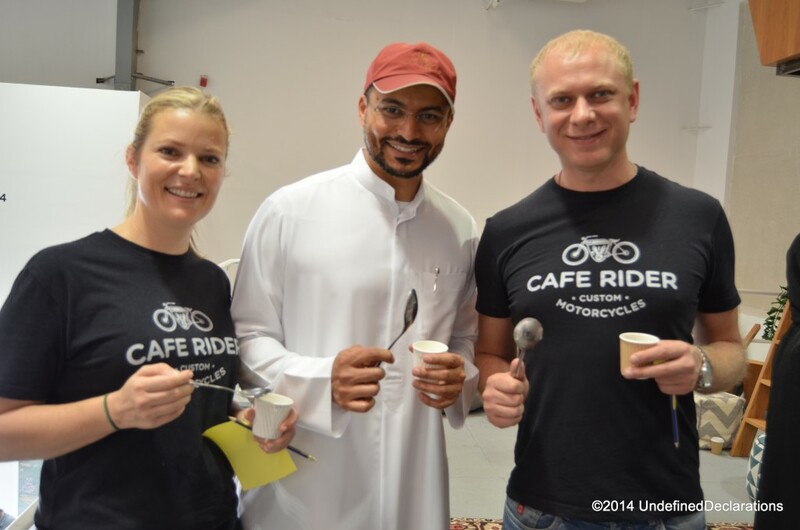 On the 1st of November, the coffee club’s tasting event was held at A4 space in the city’s creative arts and cultural hub – Al Serkal Avenue. 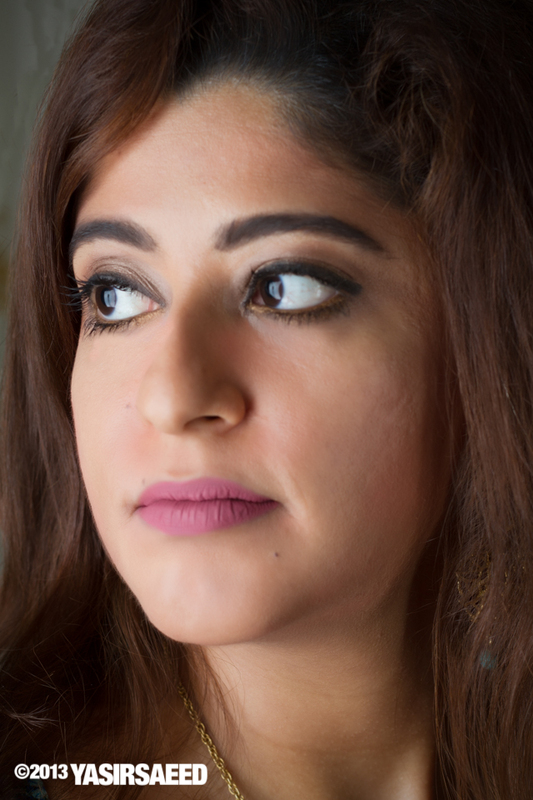 With the majority of the residents in the Gulf region accustomed to getting their coffee from the big franchises widely available around the city, the Dubai-based independent coffee club is working towards changing that trend. Getting the community involved in coffee sampling events is a greatly informative and interesting way to start this initiative. At a symbolic fee of AED 25, coffee club members get to sample coffees from a wide range of roasters from various countries, before identifying their favourite cup. 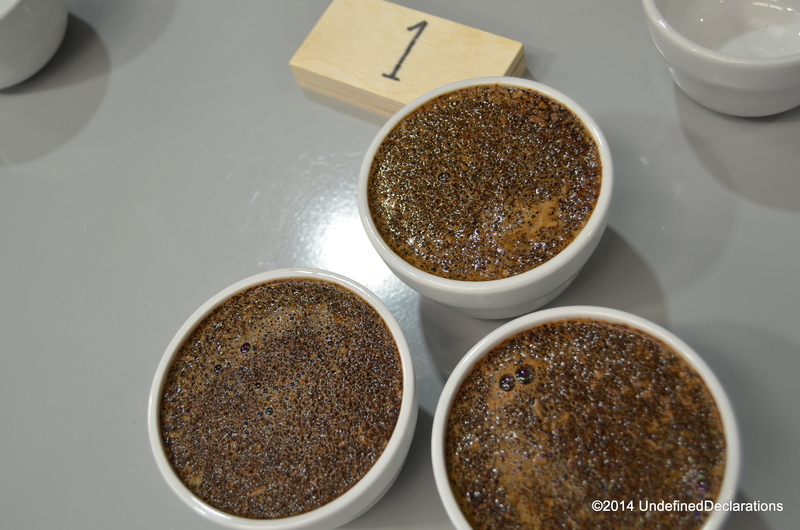 The event begins with a dry coffee sampling round, where group members smell different coffee beans and note their best pick. 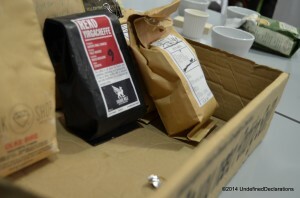 Then, a brewed coffee tasting round takes place. 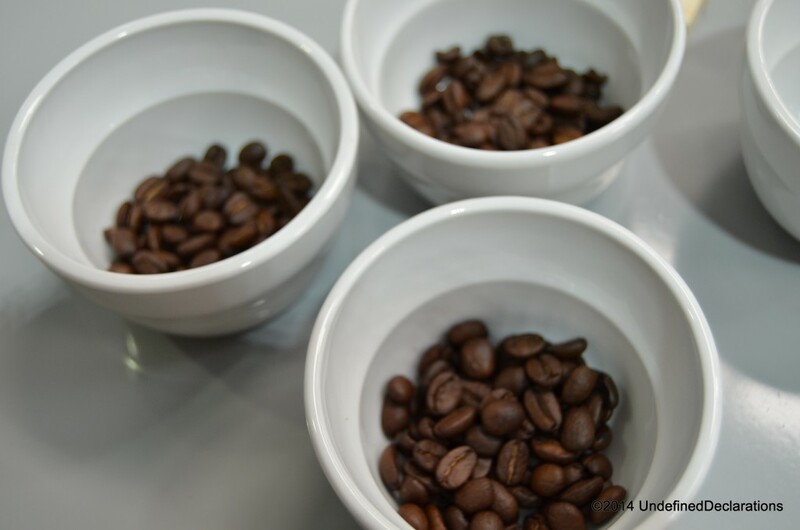 In this caffeine-filled sampling, coffee enthusiasts take little sips of various coffee cups – using spoons – and look out for distinct features in these freshly-brewed coffee selections. A devoted coffee connoisseur explained to me the characteristics that make up a good cup of coffee. 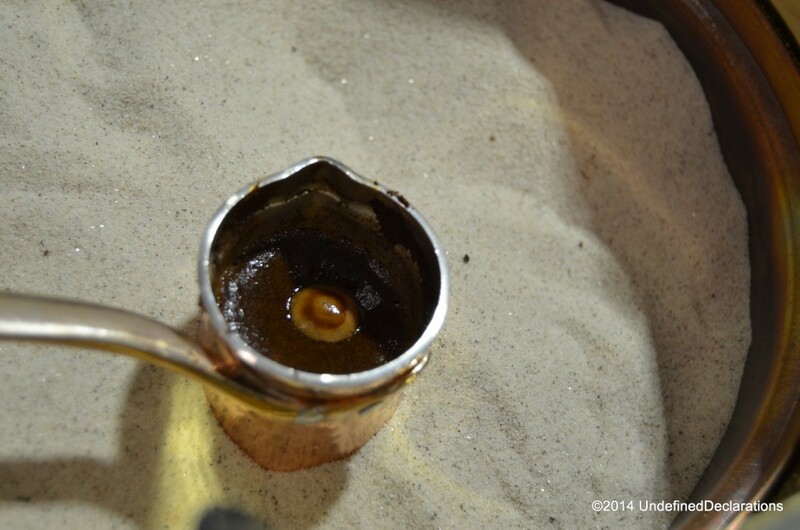 These mainly include; the body, the acidity level, the smoothness and ease to drink, and the taste. Coffee comes in a variety of diverse flavours. These include nutty, floral, citrusy, or with a hint of lime or fruit. The fun and engaging event ends with a vote for the best coffee on the table by the group members. 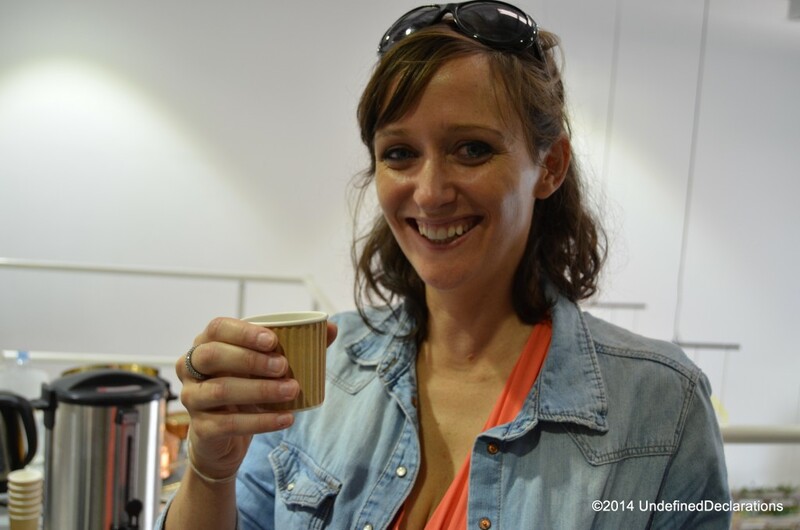 The winning brew is then served to all participants. 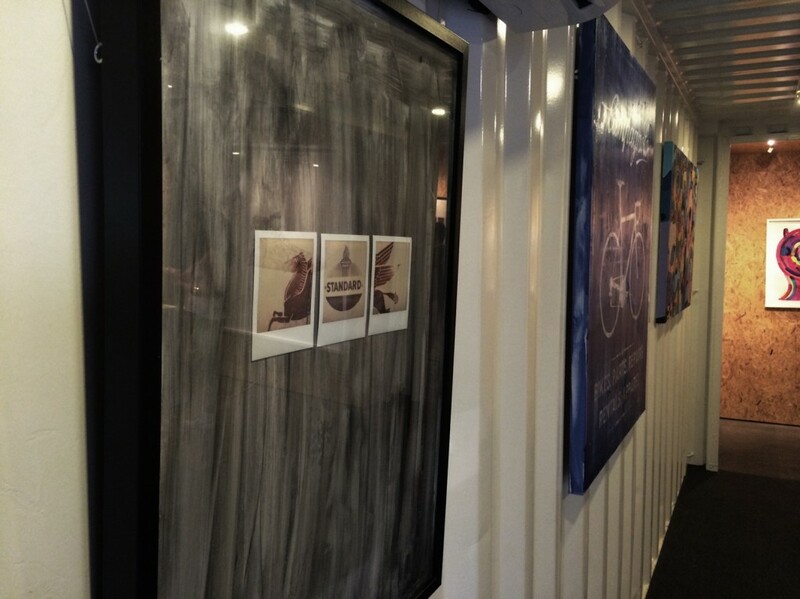 Matt Toogood – who also collaborates with Matthew Wade, Founder of Sabado Coffee Club – emphasises the fact that it is a non-commercial event that allows people to learn about the various coffee options – apart from the big brand names and franchises. 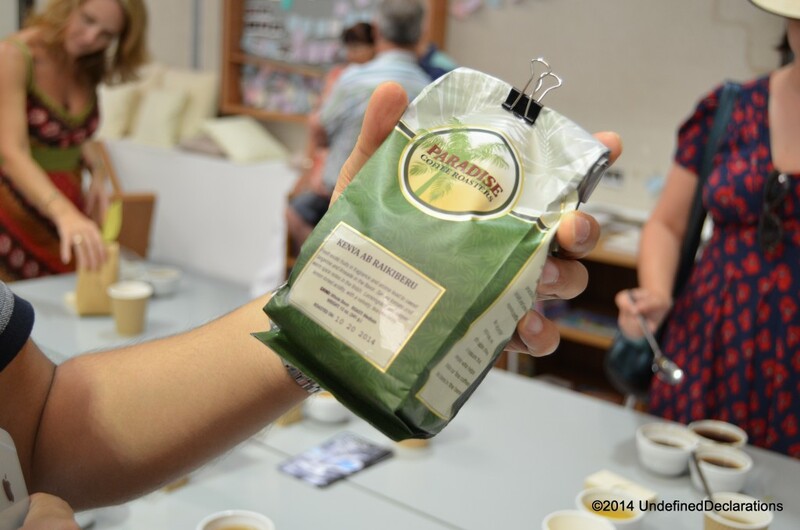 The Club’s next coffee tasting experience takes place on Saturday, the 6th of December. The event starts from 12 pm and goes on for two hours. 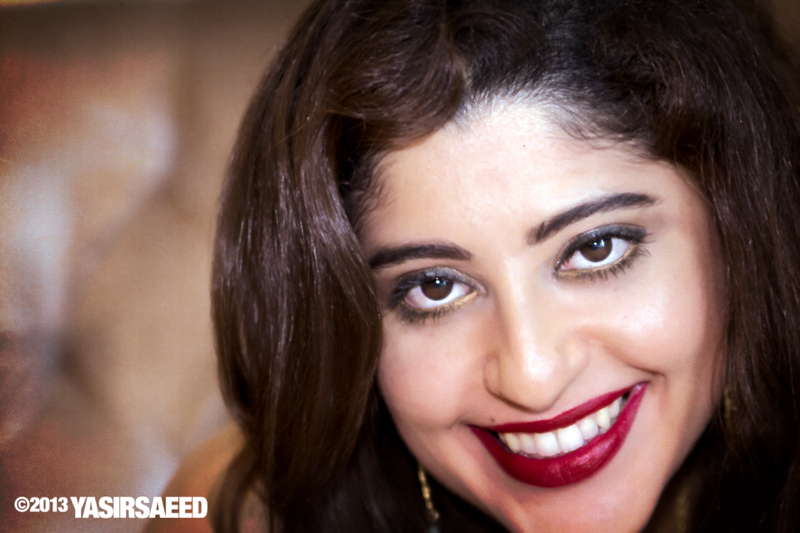 It will be hosted at “The Magazine Shop” in the DIFC area. I have a confession to make: I had leftover bean nachos and some guacamole dip for dinner (recipe will be shared soon on the blog). I feel bloated, extremely guilty and very uncomfortable. As if eating a 2-days old leftover mash of beans, corn chips and tomato sauce – that now looks like play-doh – isn’t enough to make anyone feel an ultimate surge of guilt and self-loath…I also just saw a recent photo taken of me at the Zeta restaurant and lounge opening at The Address Downtown Dubai, where I have an obvious bulging belly! And to top all of this unhealthy diet phase and low workout lifestyle, I am now overwhelmed with University projects and assignments that I need to spend a lot of time working on. This means that I won’t be able to do any proper physical exercise until the term ends sometime in mid-December! But, at least I have Yoga Ashram just across from my building. If you still haven’t read my previous posts about this lovely yoga studio, then you are missing out big time. I’ve been trying out a couple of their classes, and I must say that each class they offer is distinct and different. My latest review was of their Hatha Yoga class. This time, I tried a class called Sri Sri Harmony. Which is also very different in essence from the Sri Sri Fit class – which I reviewed earlier. What is Sri Sri Harmony? The session is comprised of a combination of breathing exercises and basic yoga postures. Sri Sri Harmony is more of a therapeutic type of yoga, as opposed to a fitness one. The main aim of this type of yoga is to bring back the awareness and balance to the body. This is done by performing a sequence of postures that are done with gentle and repetitive yogic breathing. How difficult are the postures? I must admit that the postures and breathing techniques for this class are fairly simple and easy to follow for all levels. This is a great class for beginners to yoga, as the postures are very basic and don’t require much effort. Anyone who is looking to meditate, release tension and destress should give this class a try. It’s a great way to let go of all the stress and negative emotions, and to bring more awareness and presence to the body in a very relaxed and casual environment. At the end of the class, you will notice that your breathing is more deep. You can take longer inhales and exhales, and you start to breathe correctly. You will feel as if the lungs are more open and that you are more relaxed and less stressed. I personally felt that the blood circulation in my body has improved greatly – as I always have cold hands and feet. I also could feel that my abs have toned and that feeling continued for two days after the class! Of course, with all the stress from my University school work, meditating with Sri Sri Harmony surely helped reduce my stress and anxiety levels. 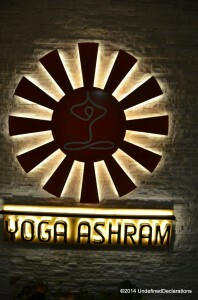 Whenever you visit Yoga Ashram, you will feel as if you have entered a new space – full of positive and peaceful vibes. That is also made more powerful with the help of the extremely friendly and genuinely kind staff. If you’re looking for a way to find peace and presence in the midst of a busy, fast-paced and hectic lifestyle, then you won’t regret trying Sri Sri Harmony. 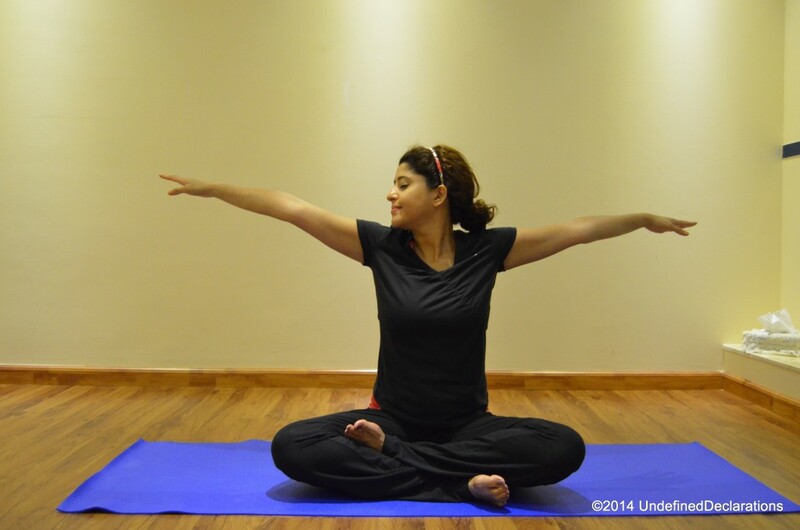 The session offers a simple and effective way to re-energize the body and soul with basic breathing and yoga postures. Note: When we breathe, we only use up to 30% of our lungs. Sri Sri Harmony helps us make use of 90% of our lungs’ capacity. Honestly, I can’t wait till I’m done with my University course so that I can become a regular at this authentic and blissful yoga studio. 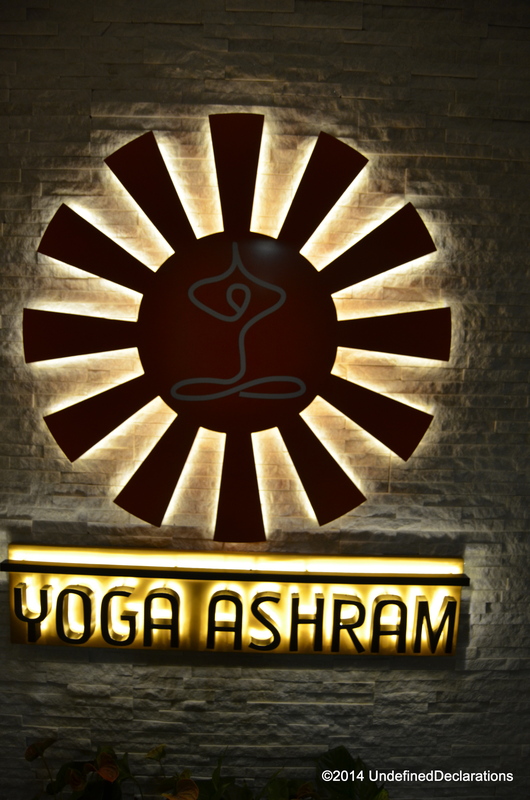 The next time you are in JLT, give Yoga Ashram a visit and you won’t be disappointed. Yoga Ashram is located in Cluster X – X3 tower (1504). I can’t wait for my next Yoga Ashram class, not only to shed off some of the weight that I’m accumulating and tone up, but also to see the lovely and warm team at that studio – who make it a truly one of a kind fitness and well-being center.